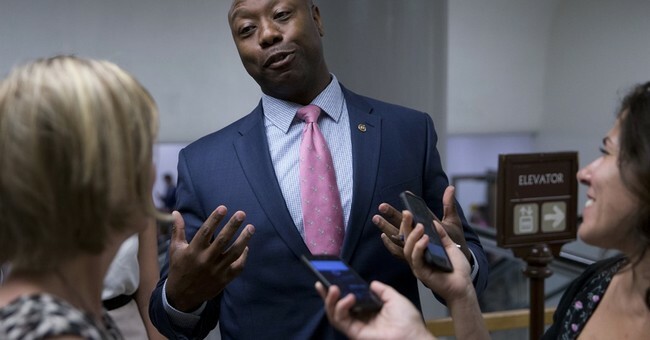 Sen. Tim Scott (R-SC) knows that a lot of people are very upset with the recent confirmation of Education Secretary Betsy DeVos. He also would really like for people to calm down. In a thread of tweets on Twitter, Scott assured constituents that DeVos has absolutely no way to destroy the public education system in the United States, nor would she want to. I am thankful for all the calls, for the passion we’ve seen about education policy for the past two weeks. We need strong public schools, as well as strong options for parents to choose the best option for their kids. The fact remains no Secretary of Education has the power to “destroy public schools” - and no one would. Scott also pledged to work alongside DeVos to try to improve education in low-income schools and to improve educational outcomes. He said this was a "passion" of his. I want true reform that strengthens public education and gives parents a choice for their childrens’ future. We will work with Secretary DeVos to strengthen all of our schools, and to make sure quality education is available to all. Because without education, incarceration rates go up, unemployment goes up, lifetime earnings go down. So while some want to continue to put band-aids on a system that isn’t working for a lot of kids, I do not. It is a life long passion for me, and I am committed to working for ALL of our kids. Scott also said that he plans on inviting DeVos to see some of his home state's worst-performing schools.